The Nike LeBron XIV Low’s Achilles pad is comfortable according to many users. The digital tread pattern on the outsole of these LeBron James sneakers have a good grip on the court. Many claim that the LeBron 14 Low is light. A good number of buyers love the colorways of the LeBron 14 Low. Several users appreciate the mobility and flexibility that the flex grooves deliver. Most purchasers say that the Nike shoes’ woven fabric uppers are breathable. A lot of buyers say that the toe box has enough space for the toes to flex. 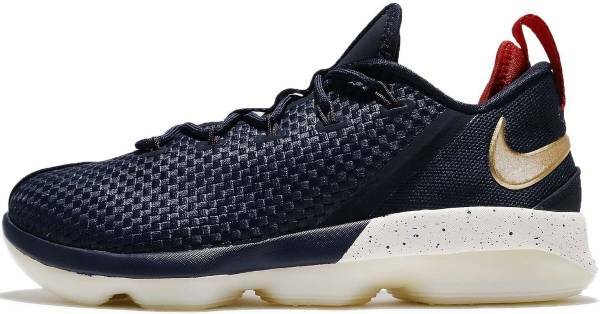 The Nike LeBron 14 Low is aesthetically appealing. A large number of buyers think that the $150 price tag is too steep for a low-top. It is as expensive as the eleventh signature shoe of Kevin Durant. Some reviewers claim that the outsole rubber easily collects dust and quickly becomes slippery. A handful of wearers complain that these LeBron shoes do not provide enough ankle support. A few mention that these Nike basketball shoes have poor foot containment. The outsole rubber easily burns out when played outdoors, according to a large number of buyers. A reviewer mentions that these LeBron James basketball shoes make him feel too high off the ground. Overall, the Nike LeBron XIV Low is a champ for both on-court and casual use. Its pristine design and vivid colorways attract many buyers. While a few consider the shoe model a dud on outdoor courts, the majority still praise the shoe for what it offers. If you love basketball shoes and trendy sneakers at the same time, a pair of the new Nike LeBron 14 Low is a must-have for you. If these LBJ kicks are too pricey, wearers can opt for a more affordable Puma Clyde Court Disrupt. It performs just as great the low-top LeBron 14. Overall, I was a bit disappointed in this shoe. It wasn't the best performance shoe but it wasn't terrible. The Nike LeBron 14 Low boasts of several technologies that justify its price tag. The Zoom technology and Phylon in the midsole work together to deliver responsiveness and cushion. The combination of mesh and woven fabric provides comfort and decent fit to the foot. For a great court grip, the outsole has a digital traction pattern. Cushion. The Nike LeBron XIV Low features the Zoom technology and Phylon in the midsole. The Zoom pods are divided into four hexagonal units so that it can strategically absorb impact. Phylon is a lightweight EVA foam that delivers a decent and well-cushioned ride. Traction. The outsole of the Nike LeBron 14 Low features a digital traction pattern with deep flex grooves. It has a good grip on the court, and it supports the multidirectional footwork of the wearer. Length and Width. The Nike LeBron XIV Low comes in the standard length and width. There are claims that the shoe runs wide, and wearers with wider feet are advised to go true to size. As for new buyers with normal sizes, they may want to go half a size down. Lockdown. The Nike LeBron 14 Low has the traditional lace-up closure. The circular shoelaces can be adjusted to obtain a snug fit. The one-to-one fit of the shoe is supported by the Flywire technology, which provides containment and support to the foot in the same way that metal cables provides strength to a suspension bridge. The upper of the Nike LeBron 14 Low is made of woven fabric in the forefoot and mesh in the rear panel. The fabric has leather overlays stitched on it to keep the shoe durable. Beneath the upper is the neoprene underlay that provides comfort to the foot. The mesh in the rear has perforations to help wick away moisture. The inner of the shoe has an Achilles pad that delivers support and cushioning to the foot. The Nike LeBron XIV Low is a one-bootie construction that comes in numerous colorways. Depending on the colorway, the outsole rubber is either solid or translucent. The remarkable Nike Swoosh is found on the heel counter and lateral side of the shoe. To signify that the shoe model is part of LeBron’s signature line, his logo is found on the aglet, pull tab, and outsole. A NIKE ZOOM callout is embossed on the heel counter. The Nike LeBron XIV Low is considered a good-looking shoe that deserves to be released in different colorways.